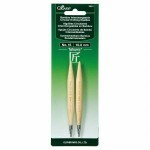 Create wonderful knitting designs on fabrics by using the Clover Takumi Bamboo Interchangeable Circular Knitting Needles. The knitting needles have an excellent shaped tip and silky finish so it loops in easily through the fabric making it smooth and simple. With a precision finish from tip to cord joint, these needles ensure a smooth ride for each stitch.